One of the foremost experts in public policy here attempts not only to describe what public policy is, but given societal changes in the last two decades, to account for its present status.To learn from the past in order to establish public policy as a discipline in its own right, Wildavsky traces its motifs from their beginnings in the 1960s to the 1980s. Starting from the premise that there has been growing polarization of political elites, he shows how public policy as a field has had to face increased politicization. For Wildavsky, the field of public policy needs to incorporate more awareness of the human aspects of policy making: he emphasizes the political choices to be made in a competitive environment and the social relations that sustain them.When the first specialist schools devoted solely to public policy came into existence in the 1960s, the programs of the Great Society were their main impetus. With the disillusionment and failure of the Great Society, the identity of public policy became transformed. New theoretical issues had to be addressed. 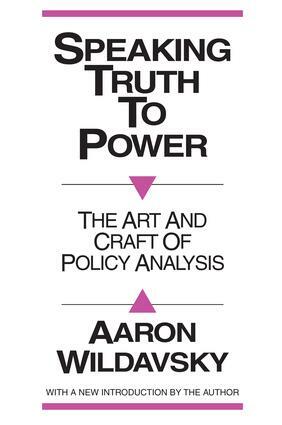 In this volume, Wildavsky provides a foundation for the theory no less than the practice of policy-making.Aaron Wildavsky is professor of political science, University of California, Berkeley. He founded the School of Public Policy there, and is presently its Director. He was formerly Director of the Russell Sage Foundation. He was the President if the American Political Science Association for the years 1986-1987.